●Quick measurement of long distance by laser, easy operation with one button. ●Laser Measuring units can be switch among meter (m), inch (in), feet (ft). ●Automatic/manual power off and laser auto shut-down function. ●Easy targeting with bright laser pointer. ●The maximum measurement range of the instrument is 98ft/30m, suitable for indoor and outdoor use. please note this type not has any prompt on the screen when it's charging, this is normal appearance, this is not issue. - Do not stare into the laser beam (maybe hazardous to the eyes). - Measuring errors can occur when measuring toward colorless liquids (e.g. water) or dust free glass, Styrofoam or similar semipermeable surfaces. 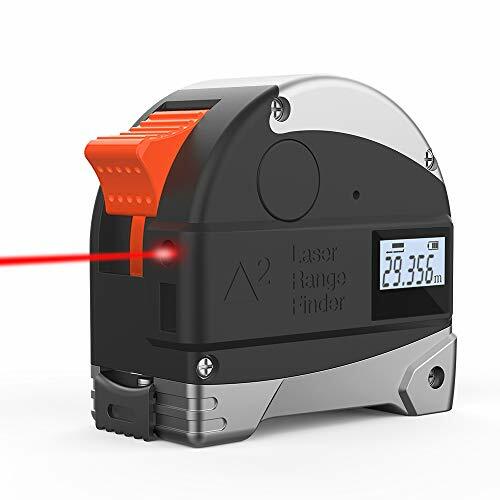 Laser digital measure make long distance measurements faster and easier with LCD with backlight for clear reading, tape measure can be use to measure short distance,length,diameter,radius,circumference easily. this is a perfect measuring tool for measurement. USB charging electronic distance meter no need to replace the battery, it's with 300mA Li-ion battery a single charge can last a week,more environmentally friendly and lightweight. If you have any questions about this product by Ameter, contact us by completing and submitting the form below. If you are looking for a specif part number, please include it with your message.